See all that yummy juice at the bottom? Relaxation in a jar. Sometimes I think about those cordial glasses. I wish I’d kept them. We came across the colorful collection of tiny glasses while cleaning out the my husband’s grandparent’s house. The glasses were tiny and dainty, stemmed, widely hued, on a little tray . I didn’t drink cordials. Bleck! Overly sweet stuff. The cordial glasses were odd and fun and I thought about keeping them. But I was trying to be restrained and practical. The pack rat in me wanted to take every treasure from that house and stuff it into every every nook and cranny of my house “just in case” I needed it sometime in the future. I’d already acquired a sewing machine and dining room ensemble, china and funky green mixing bowls, plus a myriad other things from their 90 years of life. So I put the cordial glasses in the “to sell” box, so as not stuff them into some nook and cranny of my house. How I wish I kept them “just in case,” because just in case has come. About 2 years ago in the middle of winter a friend gave me a small glass of strawberry cordial. I took it to be polite since Bleck! cordials are overly sweet alcohol. It was the best drink I ever had. Despite the chill outside, I could feel the June sun warming the straw-covered field, the scent of strawberries in the air. I was hooked. The best part was she made the cordial herself. 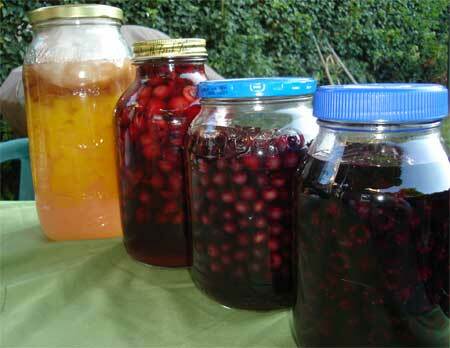 Since that fateful day, I’ve been making fruit cordials with summer’s bounty. I just made my first batch of strawberry cordial for the year and I’ll be making more. Last year, the strawberry cordial never even made it to the liquor cabinet. Upcoming will be peach, blueberry, raspberry and cherry cordial. Once you see how ridiculously easy this recipe is, you’ll wonder why you never made this before. 1. Wash and hull strawberries, then slice in half or quarters. If the berries are small, no need to cut them. 2. 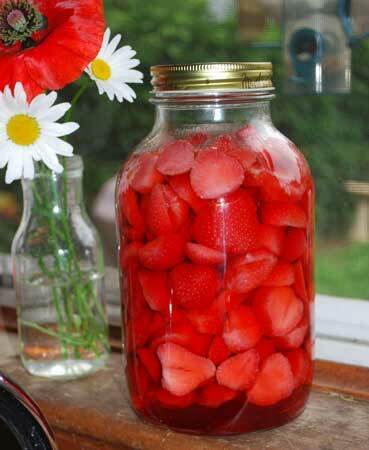 Place a layer of strawberries in the bottom of the jar. Sprinkle sugar over top. Layer more strawberries, then more sugar. Repeat until you get to the top of the jar. 3. Pour vodka into the jar slowly until it reaches the top of the jar. Put lid on tightly and store in a cool dry place for 2 weeks. 3. Strain out the strawberries and put in freezer for future use (more on that in the next post). Enjoy the cordial. 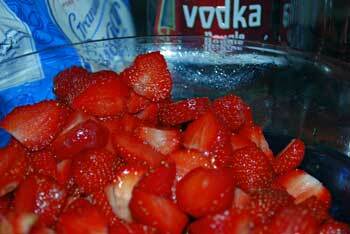 If the cordial is too sweet, stir in more vodka. If the taste is too strong on the alcohol side, add more sugar. There are no quantities for this recipe because you can do this with any size jar and any amount of fruit, be it strawberries, peach, blueberries, raspberries, blackberries or any other fruit you want to try. Last year's collection of cordials in the works: peach, cherry, blueberry and raspberry. Sadly, they are all gone. There’s a French Fry in My Soup! 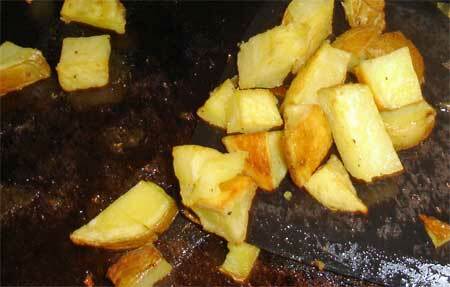 Just a quick post to share with you a great addition to soup: french fries. Rather than plunking peeled potatoes in the pot to cook alongside with the beef, mushrooms, barley and other veggies today, I roasted the potatoes in the oven while I cooked the soup up top. The potatoes joined the soup in the bowl just before serving. Yummy! They add a nice crispness to the soup, almost like croutons. Way better than mushy soup potatoes. Just wash the potatoes (no peeling necessary), dice and toss with olive oil and salt (a little pepper and basil or thyme if you’re feeling really wild). Roast at 400°F until crisp on the outside and tender on the inside (about 20 – 30 minutes). The inspiration for this came from a recent visit to a new restaurant in center square. 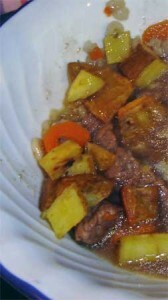 I had a pork, shrimp, beef mix like a stew with roasted potatoes. It hit the spot. Sorry about the photos. I think these are the worst photos I’ve ever posted. They beg the question: Can I write off a kitchen rennovation as a business expense because the lighting doesn’t let me take good photos for my blog?